Julia Moburg: I can't stop looking at Giles Revell - What Are You Looking At? - SPD.ORG - What Are You Looking At? 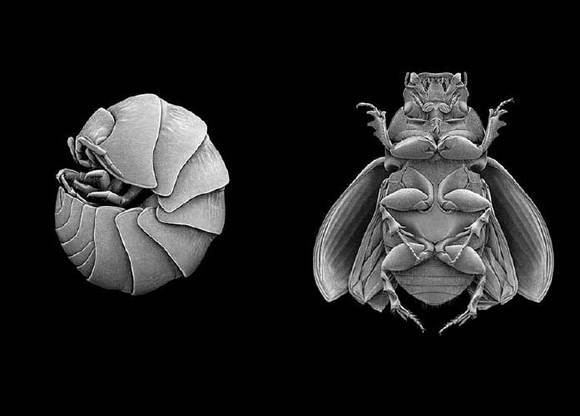 Using electron microscopy and other technologies, Giles Revell's black and white images of common insects show off nature's craft in exquisite detail. If I didn't know better, I'd think they were marvelous sculptures carved out of pencil lead. The insects are dehydrated and dusted in gold (sounds like some people I've seen on the Upper East Side) before being scanned up to 600 times. After looking at these images and you might even find some love in your heart for the roach crawling through your pantry.